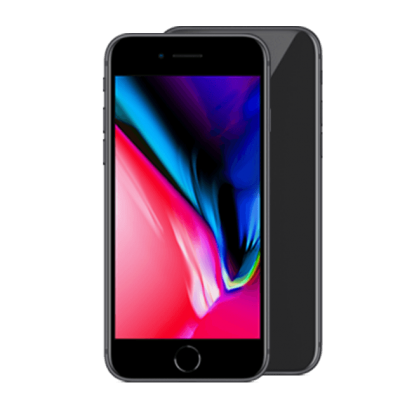 Get started comparing deals on the Apple iPhone 8 with TigerMobiles.com. With great new screen tech, plenty of power, and stunning Apple styling, this addition to the iPhone family is sure to be a crowd pleaser. Want to get your hands on one? Then just check out our pay monthly deals on the Apple iPhone 8 below. You’d be hard pushed to find someone that wouldn’t recognise an iPhone. After a decade of production, nearly everyone is familiar with the sleek styling and profile of the Apple device. But does Apple really have any more to offer after ten years on the mobile market? The iPhone 8 is the basic model in the 2017 Apple series, and believe it or not, it does have some very cool new specs and features. Why should you want an iPhone 8? There’s new HD screen tech, for a start, giving you a better than ever display. There’s also plenty of power, some nice cameras, and a bunch of extra features too. No, it’s not the best iPhone around (that title belongs to the 8’s bigger brother, the X), but it is the most affordable of the series, and you definitely won’t be making too many sacrifices to get that lower price. Clearly, this is an iPhone. From its rounded corners to its slim profile and physical home button, only Apple could have built this phone. You’re getting a glass build phone here, with a nice, solid feel to it, this really is premium quality. And given the screen size, this is a phone that can easily be used one handed and slipped neatly into a pocket. Design aside, there are some nice upgrades here from the early iPhone 7 model. There’s more power, and better cameras too. But the biggest upgrade here is the all new HD screen, which gives a far better picture than ever before. All iPhones are premium products, but the iPhone 8 is the cheapest of the new line up for 2017. If you’re looking for an iPhone but don’t want to spend too much, then the 8 is going to be the clear choice. Obviously, great performance is a key element in choosing a new phone. Apple are traditionally pretty secretive about processors and the like, but we can make some pretty solid guesses about what’s running the 8. We’re looking at hexa core processing here, with 2 GB of RAM, and the new Apple A11 Bionic chip set. Put all that together and you’ve got plenty of speed, great responsiveness, and excellent multi tasking ability. As with all iPhones you’re going to be running Apple’s proprietary iOS. The 8 runs the new iOS11 right out of the box. This gives you all the security and stability that comes with a new operating system version, as well as some nice new features, including a file manager system (new for Apple), a smarter Siri, and easier to manage storage. In short, performance here is exactly what you’d expect to see from Apple: absolutely excellent. The iPhone 8 is speedy and responds immediately to input, and you’re not going to hear any complaints from us on the performance side of things. The iPhone 8’s display is a big step up from the older iPhone 7. You’re getting 4.7 inches of screen real estate here, which is a nice compromise. The display is large enough to allow comfortable on screen typing, but still compact enough to use with one hand and to be nicely portable. Screen resolution specs get you 750 x 1334 pixels, so about 326 PPI, but that doesn’t really tell the whole story. This display is the new Apple full HD Retina screen, which means despite those low resolution numbers, picture quality on the iPhone 8 is very good indeed. Sharp, clear, crisp, and with excellent colour reproduction, the 8’s display also offer IPS tech for great viewing angles too. This is the finest iPhone screen we’ve seen on a basic model iPhone for a long time. Whatever the numbers say, in practice, the display on the 8 is a pleasure to look at. As you’d expect to see from Apple, you’re getting some very nice cameras indeed. At the front you’re looking at a solid 7 MP cam, which is fantastic for selfies and FaceTime, and gets some nice, crisp shots. Around at the rear there’s a decent 12 MP camera, 28 mm, f/1.8 aperture, which combines to make very sharp pics indeed (even when zoomed fully in). You’ll also get all the normal accessories, so quad LED dual tone flash, panorama mode, HDR recording, phase detection auto focus, simultaneous video recording and picture taking, and all the rest. As a general rule, iPhones take great pictures, and the iPhone 8 is no exception at all. You’ll be getting some fantastic shots here, and all but the most demanding of photographers are going to be very satisfied. There are, of course, tons of features on the iPhone 8, but there are some that deserve special mention. This is the first iPhone series that gets wireless charging, which is good news for those that hate cable clutter. And that wireless charging is pretty fast too, though not quite as fast as traditional charging, which is set to give you a 50% charge in just thirty minutes. You’ll get a front mounted fingerprint scanner, giving you plenty of added security (as well as access to Apple Pay, Apple’s digital wallet service). Though you won’t see the face recognition unlock that the iPhone X has. And this phone is optimised for AR, or Augmented Reality, though to be honest Apple haven’t really released a full AR system. However, AR is likely to get big in the next year or two, so at least you won’t need a phone upgrade in order to use it. How Close Was Our iPhone 8 Leak? What about iPhone 8 Deals? If you’re looking to get the best deal on an iPhone 8, then we’ve got all you need to know! If you’re looking to buy the iPhone 8 on outright combined with a SIM Only deal then you’ll be paying £999 up front for the 64GB handset. Then depending on your usage anywhere from £10-20 per month for the right usage plan. You’ll also be able to get a new iPhone 8 on a monthly contract deal with nearly all UK network operators. These deals contain both a charge for your monthly service (calls, texts, data) and a partial payment for the iPhone 8. Monthly prices will depend on how much you are willing to put down up front but will typically fall into the £45-£60 per month range. If you’re looking for the best deals on the iPhone 8 you’re going to want to wait a short while until after the launch date. Pre-ordering tends to be more expensive. In fact, the longer you wait, the cheaper deals are going to get. So if you can bear to wait we’d recommend waiting it out a couple of months and seeing what offers crop up. You’re also more likely to see the price drop on iPhone 7 and iPhone 7 Plus deals as the newer models take over in popularity. The arrival of the new iPhone is always a big deal, and tons of people want to get their hands on one. Who wouldn’t want one of the best phones around? However, Apple products come with pretty hefty price tags, so you might be wondering what’s the cheapest way to get your hands on an iPhone 8. We’ve got all you need to know right here, so you can make sure that you get the savings you need along with the phone that you want. Let’s start off by talking about exactly what you’ll be getting for your money. The new iPhone 8 is an awesome device. You get hexa core processing power, the new Apple A11 Bionic chip set, and 2 GB of RAM. There’s a 4.7 inch high definition display, that’s as clear and beautiful as you’d expect from Apple. There’s a 12 MP rear cam and a 7 MP front camera, fast charging, Siri, and all the great features that Apple always pack their phones with. Sounds pretty great, right? But the iPhone 8 is going to cost you a pretty penny. Depending on how you choose to buy though, you might find that you can shave precious pounds off that purchase price. So what exactly are your options here? You can, of course, buy the iPhone 8 direct. Buy your device from Apple and you’ll be paying £699 for the 64 GB model, complete with full Apple guarantee. You can buy direct from other stores, but prices will be about the same. We’re unlikely to see deals on the iPhone 8 until next year at the earliest, so shopping around probably isn’t going to help you too much. As a general rule you can save a little on buying a phone direct by opting for a refurbished model. Apple sometimes sells refurbished iPhones on their website. These are mobiles that have been bought and returned, run through a whole series of checks and then put up for sale again. However, again, we’re unlikely to see refurbished 8’s for a while yet. The upside of buying your phone full price is that it’s yours. You get it immediately and you own it outright. You won’t need to sign a contract, you won’t need to stick by that contract, and you’re free to sell that phone on if you get tired of it or sign a mobile contract for service if you find a good deal somewhere else. The downside is that you need to find that cash right away. That can be tough for some people. You will also need to either already have a mobile contract that you’re happy with, or you’ll have to sign up for a SIM only contract with a mobile provider. You do also have the option of buying the iPhone 8 in instalments through Apple (and occasionally through other stores too, but we’ll stick with Apple for this example). This allows you to pay an upfront price and then the balance of the cost in twenty monthly instalments. Through Apple this is interest free (we can’t speak for other providers). The iPhone 8 64 GB will cost you £69 up front, and then £31.50 per month for twenty months, coming to a total of exactly £699. The upside of buying in instalments is that you get that phone straight away even if you don’t have the cash to buy the whole thing right now. And with Apple you won’t be paying interest, so the total price remains the same. On the flipside you will be locked into a contract (and may not be able to sign a contract if you’re under 18, not a UK resident, or if you have bad credit), and will have to continue to make payments whether or not you have the phone (even if it gets stolen, for example). You’ll also still need a mobile phone contract. O2: With O2 you can pay £180 up front, then £46 per month on a 24 month contract that includes unlimited calling and texting and 3 GB of data. That comes to a total of £1284. Vodafone: With Vodafone you’ll pay £30 up front, then £54 a month on a 24 month contract that includes unlimited calling and texting and 4 GB of data. That comes to a total of £1326. EE: With EE you can pay £100 up front, then £53 a month on a 24 month contract that includes unlimited calling and texting and 3GB of data. That comes to a total of £1372 . Three: With Three you’ll pay £99 up front, then £50 a month on a 24 month contract that includes unlimited calling and texting and 4 GB of data. That comes to a total of £1299. Don’t forget that those total prices include not only the cost of the phone but also the cost of your monthly phone bill! Again, you’ll be getting your phone immediately without having to pay full price up front. In this case, though, you’ll also be getting mobile service, so you don’t have to worry about finding a phone plan elsewhere. On the negative side, you will need to sign a 24-month contract (and again, might not be eligible to do so if you’re not 18, don’t have good credit, aren’t a UK resident, or have an ongoing mobile contract elsewhere). The best deal is whatever works best for you. In all honesty, the iPhone 8 is a new bit of tech and at this point prices are very, very similar, and you’re unlikely to save more than a couple of pounds either way. That’s not to say that special offers don’t happen, they do on occasion. But on the whole, your decision will probably hinge on whether or not you have the full purchase price to pay upfront, or whether you need to pay in instalments. In the meantime, you can use our free to use comparison tool above to compare the entire iPhone 8 deal market in the UK. Apple’s iPhone 8 is a great little device. It’s got plenty of power, a great new full HD screen, decent cameras, wireless charging, and it’s conveniently compact and portable as well. If you’re looking for top tech from Apple at a relatively affordable price, then the iPhone 8 is going to be a fantastic choice for you. In terms of connectivity, you get the normal options: 4G, 3G, WiFi, and Bluetooth 5.0 as well. The iPhone 8 comes in two versions, a smaller 64 GB and a larger 256 GB option. Be aware that there is no SD card slot, so you can’t add any extra memory to this should you need more storage. Right, so is there anything we don’t like? We do like to see an SD card slot, since we like the option of adding storage, but Apple never add these so complaining about its lack is pointless. It would have been nice to see the dual rear camera that Apple have been using on top models, but to be fair, the camera on the 8 still gets great shots. Other than that, we love the iPhone 8 and think it’s a great addition to the Apple line up. If you want serious quality, great performance, and beautiful design, then the iPhone 8 is the phone for you.